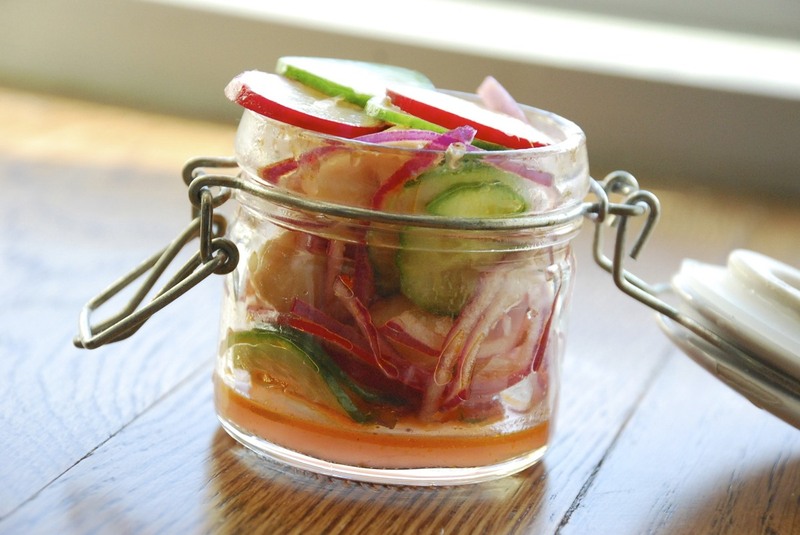 Radishes are more versatile than most of us give them credit for. Granted, they are lovely in a fresh salad, but I think it’s time to give the radish a new image. From radish dips, sandwiches and chips to curries, tarts and a pasta dish, there are lots of things to try. Here are some different ways to enjoy Radishes! Rinse the radishes and slice very thin into rounds using a sharp knife or mandoline. Set aside and now slice your baguette into 1 inch thick slices. Slather each piece of bread with about 1/2 a tablespoon of the garlic-herb butter (I used Kerrygold) and top with 3-4 radish slices. Break or cut the microgreens so they fit the length of the bread and place over the radishes. Measure out quinoa, place it in a fine-mesh strainer, rinse thoroughly with cool water, and drain. Place quinoa in a small saucepan with 1 cup water and butter. Bring to a boil, cover, and simmer over low heat. Simmer for about 15 minutes, or until all liquid is absorbed. Remove from heat and let stand for 5 minutes. Fluff with a fork and let cool completely. Toss the cooled quinoa with all other ingredients. Taste and add more salt if desired. Serve by itself or on a bed of lettuce. In a small skillet, cook 4 tablespoons of the butter over moderate heat, swirling, until browned, 3 to 5 minutes; let cool completely. In a bowl, blend the cooled brown butter with the remaining 4 tablespoons of butter and the heavy cream, lemon juice and rosemary. Season with salt. Light a grill or preheat a grill pan. In a large bowl, toss the radishes with 2 tablespoons of the rosemary brown butter and season with salt. Grill on a perforated grill pan (if using a grill) over high heat, tossing occasionally, until lightly charred and crisp-tender, about 5 minutes. Return the radishes to the bowl. Add the 2 cups of radish greens and the mint; toss well. 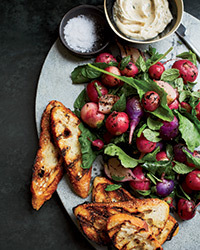 Pile the radishes and greens on a platter and serve with grilled bread, sea salt and the remaining brown butter. Add the lime juice and the rice vinegar to a small bowl, giving them a quick whisk to combine. Add the honey, and then the oil. Whisk briskly until the oil and the vinegar come together. Wash and cut the ends off of all the radishes. Slice them up crosswise, as thinly as possible. Set aside. Wash the cucumber. Slice this up crosswise too, again, as thinly as possible. In a large bowl, toss together the dressing, the onion, the radish, the cucumber and the chickpeas. Give it a taste. It almost certainly needs some sea salt. A swift crack of black pepper is a good idea too. You can eat this right away, while all the vegetables are still crisp, or you can let it sit for a bit. Letting it sit will make liquidy, more of a sauce. Bring a large pot of heavily salted water to a boil. Add the grains and cook until just tender, about 25 minutes. (With grains like wild rice and wheat berries, add them to the pot first and cook 10 minutes before adding remaining grains). Drain the grains into a colander, then set aside until warm to the touch. Combine all the ingredients in a large bowl and toss well. Season with salt to taste. Combine rind and hummus. Divide hummus mixture evenly among 8 pita halves (about 1 1/2 tablespoons each). Divide lettuce, cucumber, radishes, onion, and cheese evenly among pita halves. Sprinkle with pepper.